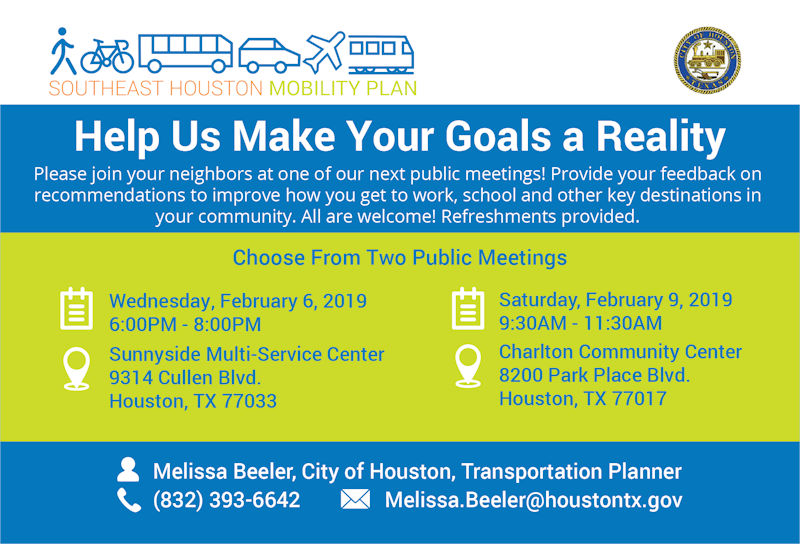 The Planning & Development Department is hosting its second round of public meetings for the Southeast Houston Mobility Plan. Come learn more about draft recommendations to improve how you get around in your community. Please arrive early for a presentation, followed by design and mapping activities to capture your feedback. The 2018 Southeast Houston Mobility Plan is the City of Houston’s multimodal mobility study (inclusive of vehicular, transit, pedestrian, bicycle and freight) in the area bounded by I-610 to the north, SH 288 to the west, Sam Houston Tollway to the south, and I-45 and Galveston Road to the east. The Plan will be used to guide the City of Houston’s short, mid and long-term multimodal mobility planning efforts and will also identify projects that will improve mobility and access in the study area. For more information, please contact: Mobility.Planning@Houstontx.gov. Register for the events on Facebook, taking place in District D and District I. Learn more about the plan by visiting our website.